Lin W. R., Chen W. C. & Wang P. H. (2011) Effects of forest thinning on diversity and function of macrofungi and soil microbes. Forest management activities influence forest structure and development, and thereby influence biodiversity. We investigated diversity and function of macrofungi and soil microbes in a Chamaecyparis formosensis forest with light and heavy thinning treatments and control plots, and we compared them with an adjacent broadleaf forest. Principal component analysis was used to separate macrofungal species components exposed to thinning treatments and those in the broadleaf forest. The macrofungal diversity in the broadleaf forest was higher than in the plantations, and the diversity of fungi from the lightly thinned plantation was higher than those from the heavily thinned and unthinned plantations. Denaturing gradient gel electrophoresis profiles showed that soil fungal and bacterial communities were significantly different among the treatments. However, the carbon utilisation patterns of soil microbes did not differ significantly among treatments. 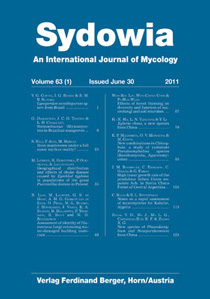 Thinning increased the diversity of saprotrophic macrofungi and changed the soil microbial community of the plantation. This finding might be due to the functional redundancy of soil microbes, as there was no significant thinning effect on the soil microbial function through the fourth year after thinning.